I’m writing this in between the door bell rings I am receiving from all the cute little critters approaching my house for candy. Last year I didn’t have decor or pumpkins out front. No pumpkins=no trick or treaters. Lesson learned. But this year I’ve already had 3 groups and it’s not even 7 pm! I wore this on Tuesday when it was around 75 degrees out with a slight breeze—for me this is the perfect fall weather. 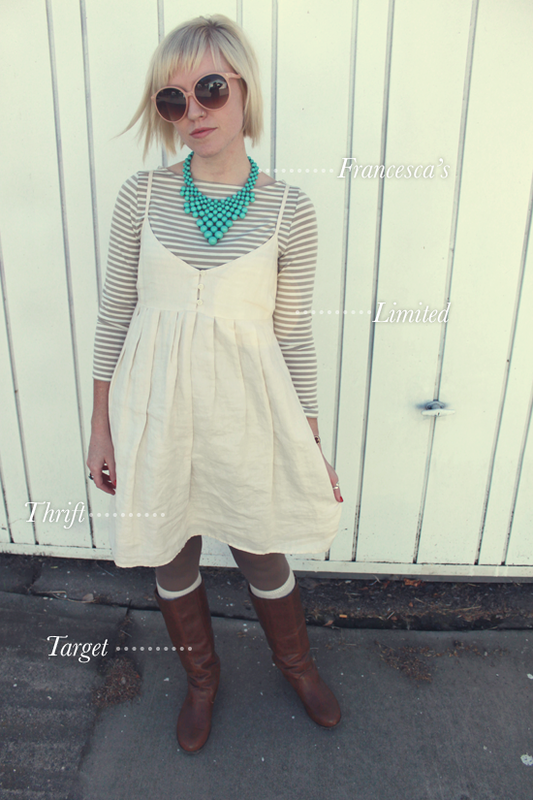 Thanks to laws of layering I can still slip on a light linen dress during the last few days of October. This is one of those outfits that just falls into your lap during your morning delirium. Suddenly you realize you have 5 other items in the same color family as the dress you picked out and then BOOM the outfit is born! One of the reasons I keep this blog going is to remind myself that I have a closet full of clothes and many many outfit combinations to be made. I am really trying to mix and match the pieces I already own. I tend not to pick items unless they are in plain sight. I try to rotate clothes by putting ones I’ve recently worn to the back, new items come to the front. This helps me so I’m not grabbing the same items everyday. What are the tactics you use to help keep your closet feeling fresh? Nice layering! I love the way you made the outfit combination. I also try to mix and match the pieces I already own. I love the boots too. Super fun outfit! I do the same think with my closest, it really makes me see new outfit possibilities and also see what I need to get rid of. 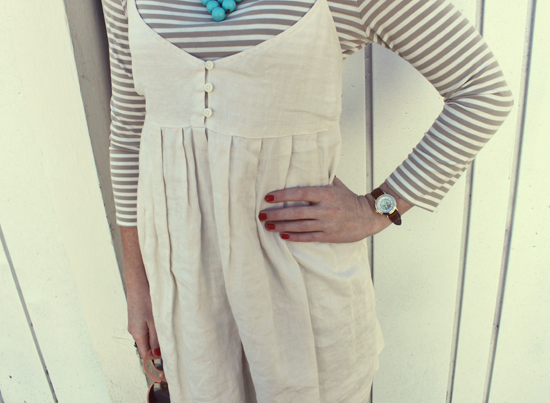 i’m always reluctant to layer my summer dresses over things, but this looks great! I’m going to have to give it a go! very cute look, love the necklace. PERFECT autumn outfit; I love it! This is so adorable!I love the way you’ve layered the items. And that necklace is gorgeous! What a great idea! I find myself always wearing the same thing…unless its the day of a blog shoot ;). I should try that tactic out. I love this outfit. I love the boots with this dress. 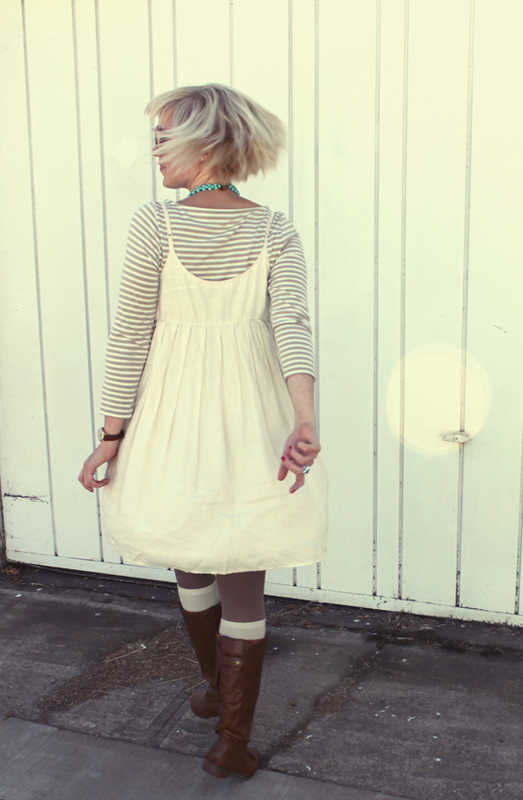 I use my blog to remind myself of outfits I can already create with my own things. I also have a pinterest board that only has outfits that I can put together with pieces that I already own. That gives me inspiration to mix and match my own clothes. Hooray! I local blogger! I’ve been trying to get a blogger meetup. I haven’t met a lot of bloggers in Sac, but I think there are some. Let me know if you’re interested! I would definitely be interested in a local blogger meetup! Let me know I could help you plan it. Would be fun! Love how your wore the dress over the stripe tee!! You look great!! Haha, fantastic layering done with the dress too! cute outfit! Love the one with your flowing while you are spinning! I actually have those same target boots! I try to mix unexpected combos to help my closet stay organized and to curb my shopping addiction. Like when I needed a black skirt (I don’t have one, I think I can the three I had away…) I just put on my black dress with the top I’d been planning on over the dress. Repurposing items definitely helps me! love the stripes and the necklace!!!! 🙂 gorgeous! Your necklace is gorgeous! Love turquoise! Just followed you on GFC. Great blog you have there! what an adorable look! 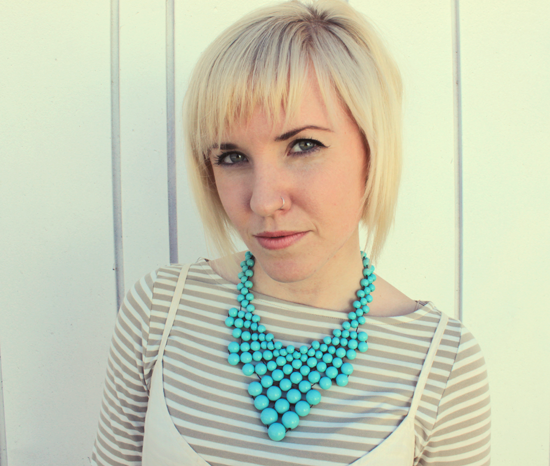 love the choice of layers and the turquoise statement necklace..it really pops. thanks for stopping by my blog! i LOVE yours 🙂 graphic designers unite..woohoo!! 🙂 i’m now following you! great outfit! I love that necklace! sometimes, when my room’s a mess and I’ve got a pile of clothes on the floor, certain pieces just happen to congregate together that end up looking good in an outfit. the best mix-matched outfits have been inspired by my messy room, I think, haha. Love the outfit! You are totally right, it’s perfect for fall! 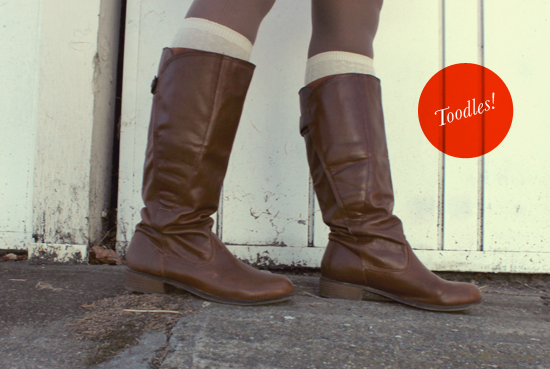 Thanks for stopping by The Shoe Journals, following you now in GFC! Cute outfit! I love how you layered the long sleeve top under summer dress! Great fall transition! i have not seen a cute blog like this ever before! love it! Hi 🙂 I find your blog amazing 🙂 so i’m following you now 🙂 mind checking my blog? It would be really nice if you could follow me back 🙂 thanks a bunch!!! i gotta say i adore your white stripes outfit. did you run out of candy? i did a white stripes blog post too, last year, & i included one of their songs.i like that band. it’s too bad they broke up.